Who better to share information on SIUE than those whose lives have been positively changed by their experiences as a student? Through the SIUE Alumni Recruitment Ambassador Program, proud Cougar alumni are sharing their experiences and sparking interest in prospective students across the country. “I had an awesome experience as an undergraduate at SIUE, and I want to help promote my school in the best light possible,” said Michael Yancey, who earned a bachelor’s in mass communications from the College of Arts and Sciences in 1993. 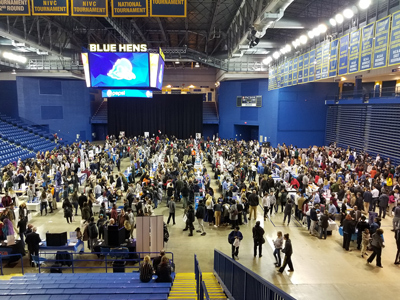 As an Alumni Recruitment Ambassador, Yancey represented his alma mater at the New Castle County College Fair in Newark, Del., last November. 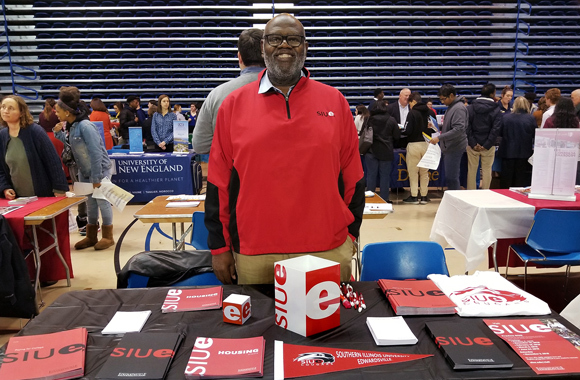 Yancey, who resides in Bear, Del., attended the college fair on behalf of the SIUE Office of Admissions to share University information with prospective high school students from that region. SIUE’s Alumni Recruitment Ambassador Program began in fall 2017, and has grown to include more than 80 alumni who volunteer their time to promote the University nationwide. Become an Alumni Recruitment Ambassador!